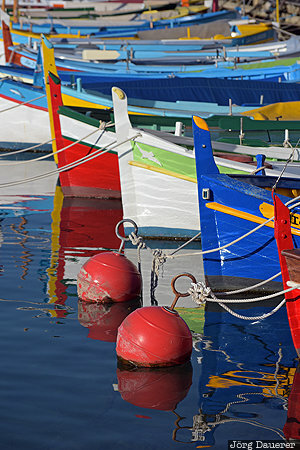 Colorful boats in Port Lympia the harbour of Nice at the mediterranean sea illuminated by warm evening light. Nice is in Provence-Alpes-Côte d'Azur in the south of France. This photo was taken in the afternoon of a sunny day in March of 2015. This photo was taken with a digital camera.